After I found some cheap cherries, that all changed. 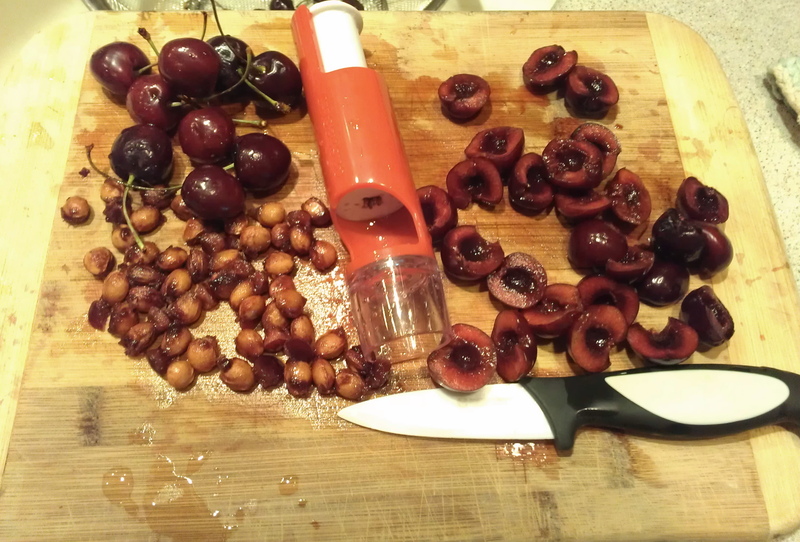 Once again, that handy little cherry pitter came in handy. 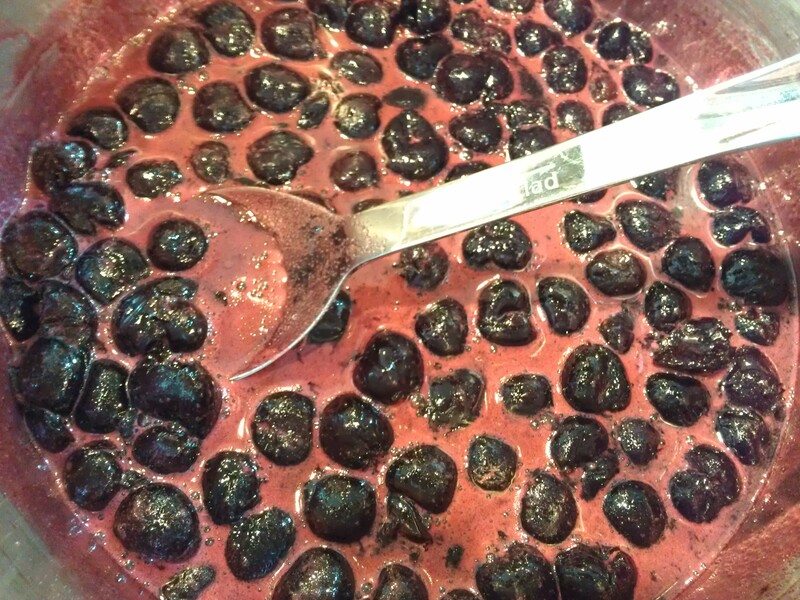 Combine half of the cherries with 10 oz. of the sugar and 1 1/2 oz. of lemon juice in a large kettle. Bring the mixture to a boil over high heat, stirring frequently, and cook until the cherries have softened, about five minutes. Turn off the heat and let the cherries rest for 5 minutes. Put the mixture in a food processor and puree mixture. After 45 minutes, place mixture back in the cooking pan. Put the cloves into a tea ball and add to the mixture. (Make sure the spices are submerged.) Bring the mixture to a boil over high heat, stirring often. Pour into sterilized jars (about six 8-oz jars for this recipe. Place on sterilized lids and screw on rings. Place in water bath making sure that the tops of the jars are covered with water. Process for 10 minutes. Right after I found these cheap cherries, the pests began to arrive in our yard. Luckily, I was able to salvage a bucket full of peaches from one of our trees (that didn’t drop all its leaves this summer) right before the Japanese beetles attacked. I made two batches of Spiced Peach Jam. Then, I looked out the window one morning and saw an entire unkindness of ravens under our honeycrisp apple tree. (Okay, I may be exaggerating a bit here but there were at least four of these avian thieves under the tree.) One was actually tossing apples down to the others on the ground. I quickly went out and shooed them away, picked the entire tree clean and came in to make Apple Marmalade. 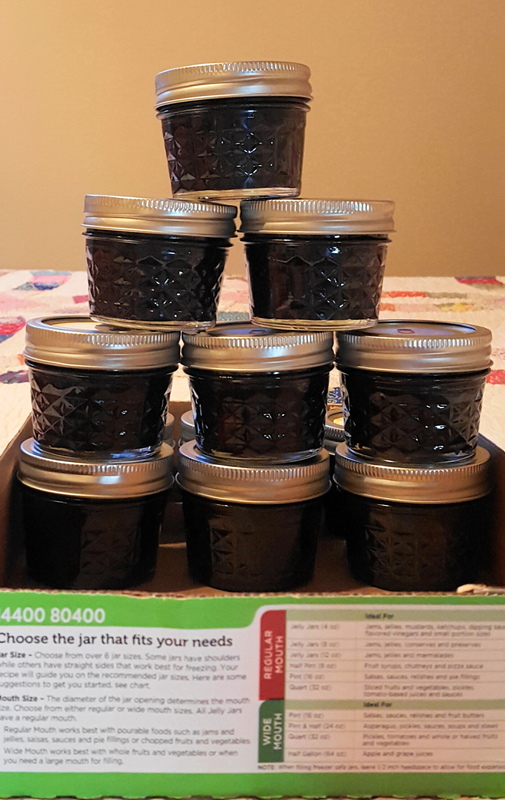 Since I pride myself in giving homemade jam for gifts during the holidays, I think that I might need to revisit some specialty jams this fall like Lavendar-Wine Jelly or Garlic-Rosemary Jelly. At least I have a few of these little jars to give out. 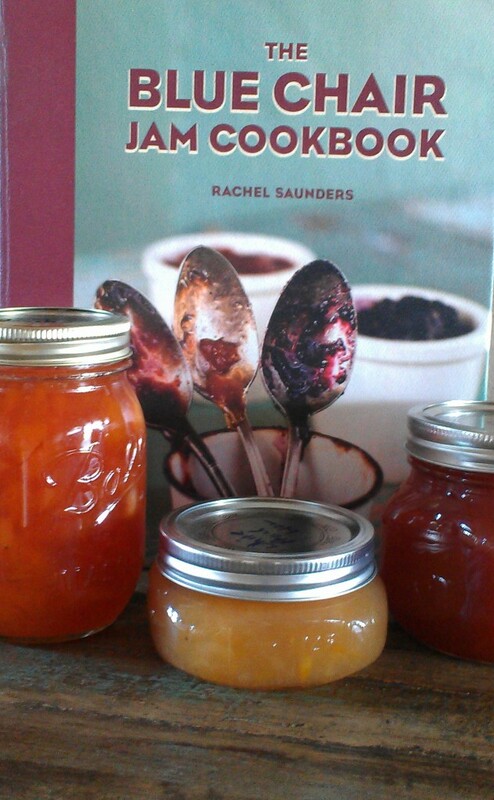 Note: If you love to make jam, you must buy yourself a copy of Rachel Saunder’s Blue Chair Jam Cookbook. I was lucky enough to get it as a gift a couple years ago. I love it. I have used Saunder’s recipes many times and they always inspire me to get into the canning mood. For all of my posts inspired by Saunder’s, please click here. 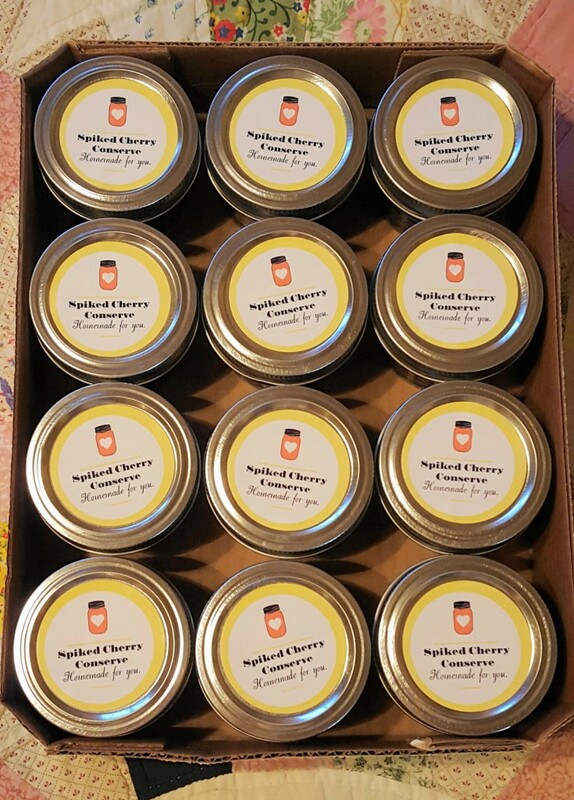 I haven’t made any jam this year..maybe I should reconsider it and get some cherries to make at least one or two jars. Your recipe sounds fantastic, Deb. I love this stuff. It smells so good when it’s cooking. What utterly WILD jam. I am totally enthralled with both the peach and cherry. I pinned the recipes on my sauce board because for me they make awesome sauces and glazes. And, I find they make great salad dressing, too. Check out the Peach Jam Salad Dressing. Even with that handy pit remover, all those cherries with pits make me nervous – what an undertaking, but seems very worth the effort!!! Great batch of jam! Love cherry jam and this jam is extra special with the cognac and dried pineapple. Great recipe! I’d be serving this with duck right now if I had a jar of this.